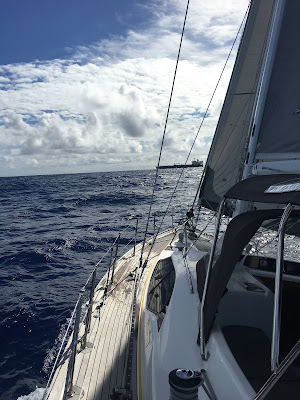 It was an overnight motor from Virgin Gorda to Anguilla, the wind was a bit stronger than we expected for the first couple of hours but by 11pm it dropped off to under 10 knots, and was a little rainy and squally but perfect conditions for the 75 mile trip east, directly into the normal trade winds. We slowed right down to make landfall at 6.30am, anchoring virtually in the same spot as the last time we were here two years ago. We had a bit of breakfast and then went to clear in. 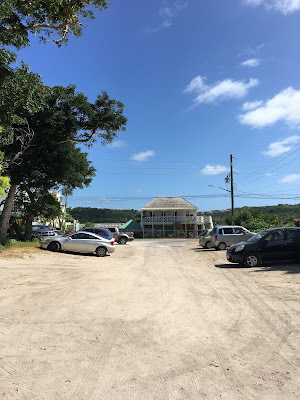 Anguilla gets a bit of a bad wrap from the cruising community as they charge quite a lot if you want to take you boat anywhere other than Road Bay; much of the island is national park and you can visit the park only with a permit. Last time we came we bought a permit and went to the other islands and anchorages but actually ended up coming back to the great anchorage at Road Bay every night. This time we decided to stay and explore the rest of the island with a hire car. The cost to be here was therefore nil and we found plenty to do. Anguilla has amazing beaches but also really good restaurants and super friendly people. It's pretty fancy as a holiday destination and it's cost to cruise around means only a few boats come and many of them are the biggest Super Yachts. First stop was the fabulous Elvis's beach bar for a light lunch, we ran into the Alkemi crew again and shared a few beach games before getting a lift to the main town, called The Valley, from random strangers that were on holiday. The next day we hired a car for a couple of days and went to explore the south of the island one day and the north the next. We found beautiful beaches, stunning panoramas and several totally abandoned resorts - that made us a bit sad. Abandoned development is widespread across the Caribbean as developers start projects without full funding in place, hoping to finish construction by selling off the plan during the construction phase. It really is short sighted of the government to allow this to happen as it destroys the enviroment for the next generation. We've literally seen hundreds of examples of this on our travels. We might have taken the car to some off the beaten track spots! We ate lunch at the fantastic Blanchards, local restaurant on the beach with this view. On Sunday afternoon one of the restaurants hosted a fund raiser and BBQ for the local sailing club, we met up with the Alkemi crew and had a nice afternoon eating, listening to music and watching the sailing. Wilbur and Sophia went for a sail and got a bit wet.... Wilbur taught Andrew how to make a soft shackle while Nellie dug holes. We totally loved our time in Anguilla and Andrew only spent one day working on the outboard - the new carb didn't fix the problem so he is now systematically working through all the parts on the outboard. We managed to buy new fuel hose in Anguilla from a lovely man who ran the automotive shop - he offered Andrew a job and tried to sell us his boat.... We were torn about staying or using another light wind period to head to St Barths for some diving and then Antigua by Christmas - the plan won over anxious that the 'Christmas Winds' might set in and we would no longer be able to make it further east. 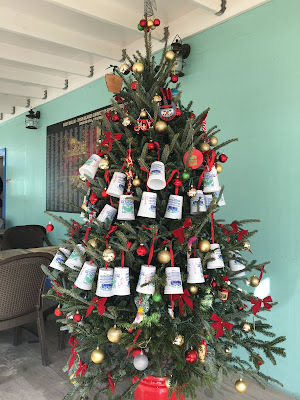 We had braced ourselves for significant hurricane damage in the BVIs, however we found that some places you could hardly tell the difference and other places were still totally devastated and a few had improved. 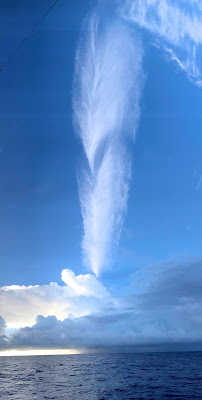 The thing that was evident everywhere was the impact on the people, hurricane Irma defined everything; many people are still shell shocked, even if you don't mention it every conversation comes back to the hurricane in some shape or form after a few minutes. I do think the community appeared more supportive of each other and perhaps even more welcoming to us yachties. We spent two nights at Great Harbour in JVD when we first arrived and learned that our outboard was playing up. But after cleaning the carburettor Andrew managed to get it to work and only stop after a few minutes. The weather was so lovely and calm for the next few days we decided boat jobs could wait as we were keen to get some diving in. We dive 5 great dives right from Askari with no need for our outboard. After a great dive on the Rhone Mail Ship we pulled in to Cooper Island planning to do another dive that afternoon. As it happened the entertainment came to us when a mother and calf dolphin swam right by Askari. At the time we were chatting with David who had swam out from the resort - we threw him a mask and the dolphins stayed - I hopped into, then Andrew, and David's wife swam out. We played with them for about an hour, it was just amazing. That night we went for a lovely meal at the Cooper Island resort to celebrate our Wedding Anniversary. We met Case and Sophie who were on an English Cat moored ahead of us - they came back for drinks with us - Case was obsessed with fish so decided to get a boat; this was all totally new to them but they were on a mission to find fish! Willy T's is an institution in the BVIs. We had such a funny night there with my Mum and Dad. The boat bar was destroyed in the hurricane but they are back with a virtually identical new boat now moored in Peter Island but the antics are still the same. The outboard now had to be attended to so we thought we'd sail up to Gorda sound, popping into the Baths on the way for a quick early morning hike - no change there. We actually ran into Jeff from Sky Larks on the beach with new crew - our first Buccaneer catch up. Up in Gorda sound we managed to get fuel cleaner at Leverick Bay and then anchored in the lovely prickly pear island. While Andrew was working on the outboard Steve and Wilbur from Alkemi called by to offer assistance - Wilbur is an auto mechanic from Queensland and quite a character. Andrew had it under control but we joined them for a beach fire and bbq that night together with Sophia who cooked the most amazing whole Aubergine on the fire plus the gorgeous Nellie Dog. Some progress with the outboard but now parts were required plus we needed cash so we headed to Trellis Bay where we could safely leave Askari and hire a car at the airport. It was quite a shock sailing in to see Marina Cay destroyed and then the last resort on our Bellamy Cay gone and then in Trellis the bay shore is lined with wrecks. Wow! We managed to organise the parts for the outboard ( a new carburettor and gaskets), pick up some other provisions within an hour of getting the hire car, So we took the opportunity to drive around the island. We picked up a local girl who was hitching to Carrot Bay she pointed out the new restaurant at the Sugar Mill - a quick u-turn after dropping her off and we enjoyed a fantastic lunch with an amazing view of JVD. We then spent a few days hanging around the islands of Francis Drake channel while our parts were shipped. We got to catch up a couple of nights with Julie and Richard on Escapade - they also had parts and then family coming in. Richard cooked us an amazing roast dinner complete with crumble - delicious! 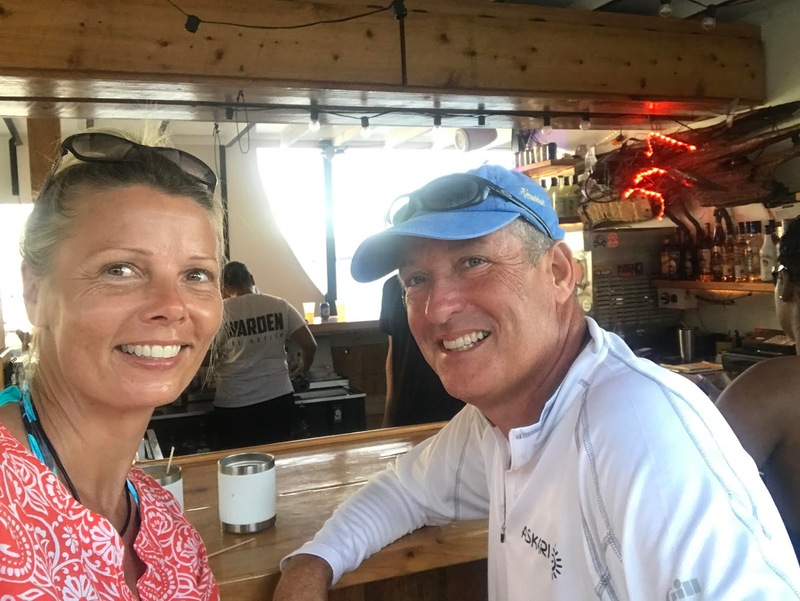 The parts took much longer than we thought so we escaped back to JVD for the weekend and ran into the Alkemi crew again - big hangovers again.... We did however make it for a great walk to the Soggy Dollar Bar and then back over the top of the island to Great Harbour. Hike back over the top of JVD - good hiking gear! We had a fairly good swell so took a detour in to see the Bubbly Pool we hadn't been to before. Sadly the camera battery went flat as it was pretty cool, the swell breaks through the rocks forming a pool of champagne bubbles. It was windy for the next evening so we tucked into Cane Garden Bay for a relaxing afternoon followed by a lovely evening at Paradise Club. A Bean Bag and an Aperol Spritz - who is this guy? Finally the parts arrived, we scooted in to Road Town and got them plus some provisions cleared out and then made a quick pit stop for a swim at Gorda Sound. Alkemi had the same plan so at sunset we together with a "flotilla" of other boats grabbed a weather window to head East. What a fun three weeks BVI. 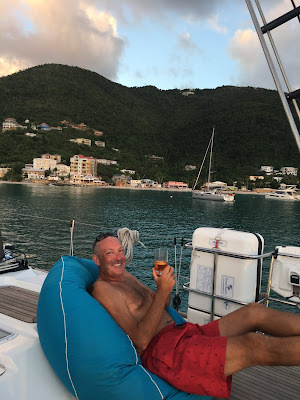 We arrived in the BVIs to a fabulous period of settled weather, so we we abandoned all boat jobs following the passage, had a cocktail in Jost Van Dyke and then went diving for the next week in lovely calm conditions. It was super fun to use Askari as a dive boat and take advantage of the marine park mooring all over the BVIs. Every night we fell into bed in a calm spot exhausted but this was just what we had been dreaming about for the whole trip down to the Caribbean. We spotted land just after 6am this morning while motor sailing at 7.6 knots, by 10.46 we had arrived in Great Harbour Jost Van Dyke. Our passage was 7 days and 23 hours, 1,170 rumb line, our route sailed was 1,377. We had a maximum sustained wind of 20 knots, as a result we used the engine for 79 hours. We had wind from every direction, frustrating current against us but experienced only 4 squalls and just one with a big wind shift. On the wildlife front we saw one white bird and a few flying fish, annoyingly in the cockpit on two occasions. Askari was amazing and the only breakages was the water tank sender that got stuck (easy fix with a magnet) and the oil pressure gauge on the engine which was a bit disconcerting until Andrew realised it was just the sender playing up. This passage ended up being really straightforward and nicely boring, however we were really glad to have it behind us. Our last boat was in a really mean hurricane on this passage with her previous owners and they wrote a number of articles which I have read many times so that's what I had in my mind all the time. Andrew did a fantastic job of picking the weather window and managing our route as a result I think we've had a much more comfortable trip than many down to the Caribbean this year. 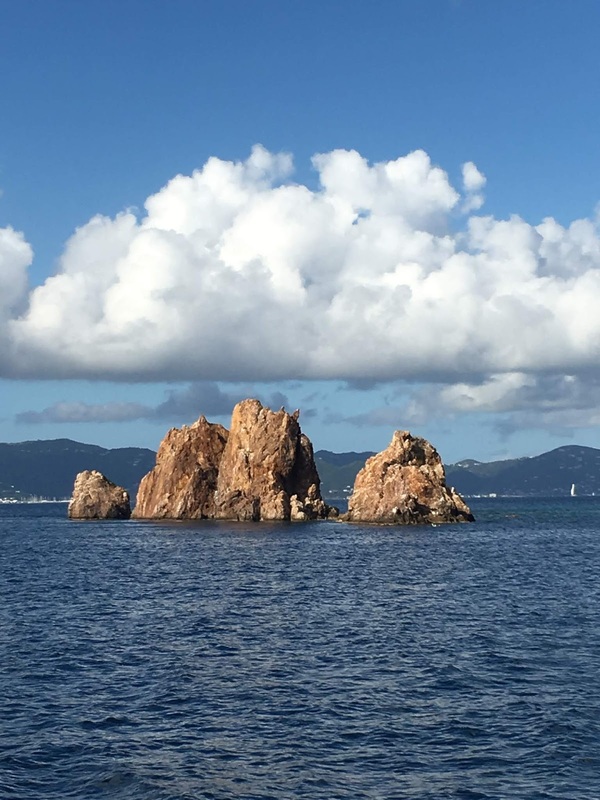 Yesterday was mostly a cloudy day with light winds and we just motor sailed on a rhumb line towards the BVIs. It was a bit boring but that is good on an ocean passage, especially as we are now getting close enough to be able to plan our arrival. We really don't like motor sailing but sometimes it's just necessary - even though it makes Andrew a bit grumpy. 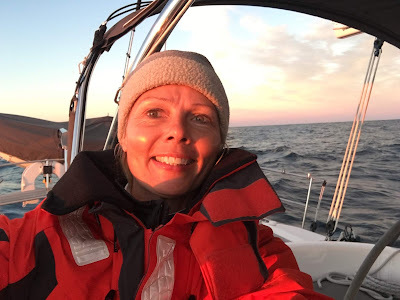 This morning was a spectacular sunrise over a clear sky just as the full moon set, the wind then gently filled in from the South East and we were able to start sailing again - oh joy! 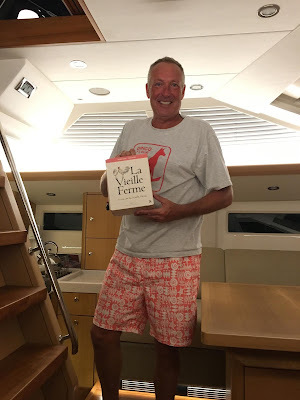 It felt like a such a gift and we both showered and spent some time on the aft-deck reading as Askari gently sailed us right towards our waypoint. 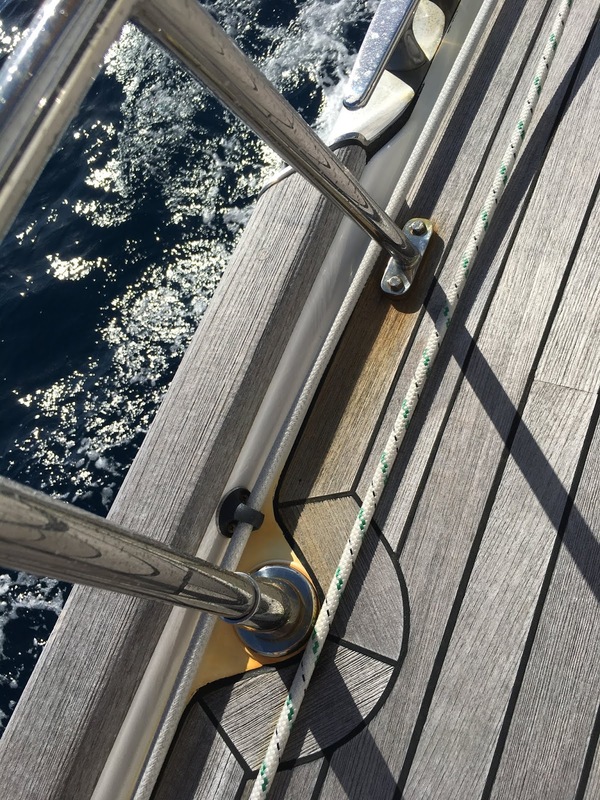 The only thing that spoilt this beautiful morning is rust - OMG I can't believe what a week of sailing into the wind with the foredeck being virtually being under salt water all the time has done to my stainless steel. All the staintion posts have leaked a rust around their base, the surrounding deck and even down the hull where the water runs off the boat at mid-ships. Anyone who knows our boat knows I might be a little obsessed with keeping the stainless shiney so seeing like this is just making me crazy. I can't bear to look at it and am hoping I can get it cleaned up before we pull into an anchorage. Ah these our my first world problems of the day. We had good copy on most of the Backstreet Buccaneers last night on the SSB and everyone is now south enough to avoid a mid storm that is coming off the US East Coast so that was a relief. One of the yachts may have been enjoying a few wines for thanks giving..... We have loaded our fridge for arrival and will be ready to taste our first beer when we get in, hopefully Saturday afternoon. We have 163 miles to go. Overnight Andrew spoke to a yacht who had run out of fuel and was sailing slowly - they didn't need any assistance but this made me glad Andrew is as obsessed with fuel management as I am about stainless. So the engine has been on since yesterday mid afternoon. We sailed into a wind hole about 2.30pm and then conducted sea trials to work out the best angle for speed and comfort; we snaked around the ocean for about half an hour testing all different sail and motor configurations and the result was motor sail into the wind as close as possible - about 28 degrees apparent wind. The sea had calmed off and only occasionally sent a curly wave to slam into us and knock out our speed over the ground. We had calculated that based on our VMG for yesterday afternoon we would be arriving in the BVIs on 22nd December - this confirmed it was time to put the engine on, even though it's actually pretty nice out here. Last night on the radio net we were discussing Christmas plans as many of the boats behind us are also without wind and are a bit worried about fuel supplies; we have used very little until yesterday so were in good shape. A couple of them had however been in for a swim it was so calm. 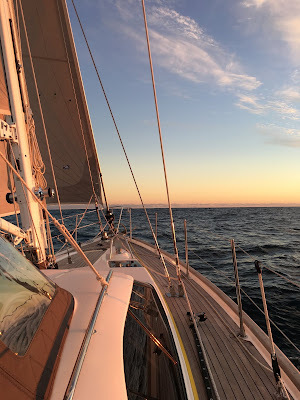 Our wind was about 6 knots and varied from 6 to 12 over night with a bit of a confused sea with weird currents and swells that would come and go. To keep things comfortable we had to keep adjusted our course a little now and again but mostly just got a good night's sleep. We both find the drone of the engine quite soothing. Today was supposed to be really light winds but its been around 10 knots from the SSE all day, we are expecting it to stay light and move around to the south east, which would be more comfortable for tonight. We should pick up wind for sailing tomorrow from the South East and then East. If we can keep this speed up we should arrive in the BVIs on Saturday late afternoon which would be pretty exciting. Bring on the Painkillers. It's been a mixed bag over the last 24 hours, yesterday afternoon was lovely gentle sailing in about 10 knots of wind, sunny skies and we couldn't quite believe we were out in the Atlantic Ocean. For the first time we started talking of arrival and what we would do first when we get to the BVIs. We carried on sailing into the night and it was lovely although we were on squall watch as we had heard a band was heading our way after midnight. 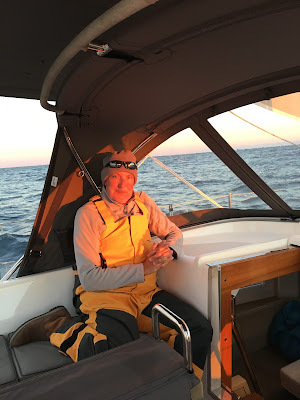 The wind however died around 4 am and I put the engine on a motored on a more southerly course as that direction looked to be our challenge over the next few days. We started off motor sailing but then by 7am the sails were just flapping and squalls were around. Andrew furled the sails and we motored south for a bit and we both rested. A large squall washed the boat off and confused the sea then the wind gradually filled in from the south. We tried all sorts of options to get the boat moving but this sailing boat loves to sail more than anything; so a wind angle of 40 degrees close hauled and we were off. We are making about 5 knots of VMG (ie 5 miles an hour directly towards our waypoint) and it's super comfortable plus not using any diesel. I'm just about to get lunch sorted - I made a lovely chicken and leek fritatta in the light conditions yesterday so leftovers today - yum! Had the most amazing sailing overnight with a nearly full moon and the brightest shiniest stars I ever saw. Andrew did get hit with a flying fish in the cockpit which he wasn't best pleased about as they really are the most stinky fish in the world. I radioed Sea Larks and they were already reefing, now I just had to wait for the rain. As usual the other side of the squall the wind died off for about 10 minutes and then we were back underway again. Now he gets up for a cup of coffee! Happy Wedding Anniversary to us! Yay we actually remembered for once…. To celebrate we are back in bathers, Andrew had a shave and I have even washed my hair. The wind eased off over night and we had a great calm sail from about 10pm onwards. It's amazing that we have still only run the engine for an hour on this whole trip. This morning the wind has come around more to the East (from north east) and we've followed it on a more southerly course. We have unusual wind on this passage, which we expected to be using fuel to get east. An upper level trough has sat just below our course for the last 3 days creating the north easterly winds we've ha,d in the region of 10-22 knots. Later today we expect to cross it, pick up some squally weather and then get light-ish south to south westerly winds on the other side. Right now it's gloriously warm, we are fishing and have both Escapade of Rame (Oyster 485) and Sea Larks (Catamaran) on our AIS. It's funny as we have been within 20 miles of Escapade since we left - I know for a fact that neither Andrew or Richard would be following each other however they definitely appear to follow the same philosophy and the boats both enjoy sailing into the wind, even in some of the seas we had yesterday. On our radio net last night, there were a few reports of sea-sick crew, kids and dog- hopefully everyone had the same lovely conditions we had last night and will be a bit more cheerful tonight. I actually don't mind being on the wind as you can get wedged in and plan to do things carefully knowing the boat will stay on one side - yesterday with big square waves was a little more lively certainly though…..
We've been reading, listening to podcasts and sleeping mainly, I have also learned how to get the weather in on the SSB, something I've been meaning to learn for the last 2 and a half years. Andrew went out for deck inspection this morning and all was good, just a couple of spare halyards to tighten up. So all is very well and we are having a lovely day. Position 31 degrees 29 minutes north, 072 degrees 18 minutes west. Its fast and furious out here this morning, actually most of the night - Askari or course loves it and we are wedged in. We have a double reefed main and full genoa and it's actually comfortable enough. I'm popular as I just cooked a sausage sandwich. We haven't had to run the engine and are in serious fuel conservation mode as motoring is expected in the coming days. There's more wind than we expected so are taking the opportunity to use it. Position 33 degrees 7 minutes north 074 degrees 28 minutes west. Sailing in 10 knots of wind from the north east. We had a great gulfstream crossing over night and sailed all but an hour when the wind was light. 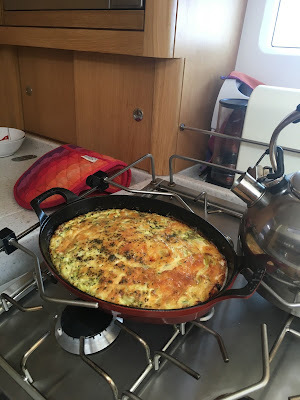 It was chilly but sunny all day yesterday and we eased ourselves into passage mode with a customary lasagne for dinner. This morning it's unbelievably warmer - the fowlies are packed back away and its a beautiful day with light fluffy clouds. We are just hoping this wind will hold and we can keep sailing. All well and happy aboard.